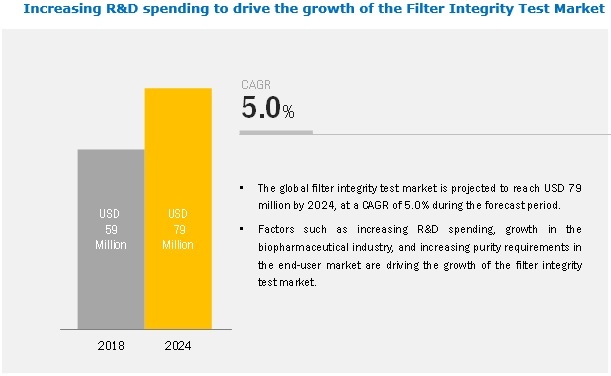 [106 Pages Report] The filter integrity test market is projected to reach USD 79 million by 2024 from USD 59 million in 2018, at a CAGR of 5.0% during the forecast period. Factors such as increasing R&D spending, growth in the biopharmaceutical industry, and increasing purity requirements in the end-user market are driving the growth of the market. By type, the diffusion test segment to register the highest growth rate in the filter integrity test market during the forecast period. Based on type, the market is segmented into diffusion test, water flow integrity test, and bubble point test. In 2018, the diffusion test segment accounted for the largest share of the filter integrity test market. This segment is also expected to witness the highest growth during the forecast period. The advantages offered by the diffusion testing method such as high sensitivity, high margin of safety, and testing of the complete filter system (cartridge and housing) are supporting the growth of this segment. By mechanism, the automated filter integrity test segment to register the highest growth during the forecast period. Based on mechanism, the filter integrity test market is segmented into automated and manual filter integrity tests. Integrity tests based on the automated mechanism accounted for the larger share of the market in 2018. In automated integrity testing, the data is not manually entered into the integrity test instrument, which reduces the risk of human error. Moreover, the filter can be tested in-line without the user having to initiate the test manually, and test results are automatically transferred to a data storage module. These advantages are supporting the growth of the automated integrity test segment. Pharmaceutical and biopharmaceutical companies are the largest and fastest-growing end users of the filter integrity test market. Based on end user, the filter integrity test market is segmented into pharmaceutical and biopharmaceutical companies, CMOs, and other end users. In 2018, the pharmaceutical and biopharmaceutical companies segment accounted for the largest share of the market. This segment is also expected to witness the highest growth during the forecast period owing to the growing biopharmaceutical industry, significant growth in the biologics market, and stringent government guidelines for purity requirements in pharmaceutical and biotechnology manufacturing. North America accounted for the largest share of the filter integrity test market in 2018. The market is divided into four major regions—North America, Europe, Asia Pacific, and the Rest of the World (RoW). In 2018, North America accounted for the largest share of the market, followed by Europe. The increasing demand for biopharmaceuticals and implementation of drug safety guidelines by the FDA are the major factors driving the growth of the filter integrity test market in North America. The market in the Asia Pacific is estimated to grow at the highest CAGR during the forecast period. Significant investments by key market players, increasing government support, developing R&D infrastructure, and growing expertise and academic excellence are the major factors fueling the growth of the market in the Asia Pacific. Sartorius is a prominent player in the market. The company has a wide range of product offerings, which include filter integrity tests, transfer equipment, bottles, and bags. The company mainly focuses on product innovation and has a strong geographic presence in Europe, the Americas, and the Asia Pacific. The company is expected to grow at a positive rate in the market due to its superior product offerings. Merck is another major player in the filter integrity test market. The company has a strong geographic presence across the Americas, Europe, Asia Pacific, and the Middle East and Africa. Merck focuses on inorganic strategies to maintain its leading position in this market. For instance, in 2018, the company signed a MoU with Schneider Electric (France) to automate biopharmaceutical processes for China’s biopharmaceutical industry. In 2018, Thermo Fisher Scientific opened the new Bioprocess Design Center in Shanghai, China to connect and collaborate with biologic developers to design bioprocessing solutions. Merck opened a new manufacturing and distribution center for its life science business in Mumbai, India to increase its gross domestic product storage and meet future bioproduction demand. Thermo Fisher Scientific acquired the Advanced Bioprocessing business from Becton, Dickinson and Company. With this acquisition, the company expanded its product portfolio of life sciences solutions. What are the regional growth trends and the largest revenue-generating region for the filter integrity test market? What are the major drivers and opportunities of the filter integrity test market? Which is the major test type of filter integrity test? Who are the major end users of the filter integrity test market? The study involved 4 major activities in estimating the current market size for filter integrity test. Exhaustive secondary research was done to collect information on the market as well as its peer and parent markets. The next step was to validate these findings, assumptions, and sizing with industry experts across the value chain through primary research. Both the top-down and bottom-up approaches were employed to estimate the complete market size. Thereafter, market breakdown and data triangulation were used to estimate the market size of segments and subsegments. In the secondary research process, various secondary sources such as Hoovers, Bloomberg Business, Forbes, and Dun & Bradstreet have been referred to, so as to identify and collect information useful for the technical, market-oriented, and commercial study of the filter integrity test market. These secondary sources include annual reports, press releases & investor presentations of companies, Bio-Process Systems Alliance (BPSA), BioProcess International, BioPharm International, National Center for Biotechnology Information, and Life Science Leader. Secondary research was mainly used to obtain key information about the industry’s supply chain, the total pool of key players, and market classification and segmentation according to the industry trends to the bottom-most level and regional markets. It was also used to obtain information about the key developments from a market-oriented perspective. The filter integrity test industry’s value chain and market size, in terms of value have been determined through primary and secondary research. After arriving at the overall market size—using the market size estimation processes explained above—the market was split into several segments and subsegments. To complete the overall market engineering process and arrive at the exact statistics of each market segment and subsegment, data triangulation and market breakdown procedures were employed, wherever applicable. The data was triangulated by studying various factors and trends from both the demand and supply sides of the filter integrity test industry. This research report categorizes the filter integrity test market based on type, filter type, mechanism, end user, and region.